We started off by having one of the business partners fill out my Branding Questionnaire, which helped me gather important information, not only about their own desires for the brands look and feel, but also about their target demographic. This information is extremely important when designing your brand, and I never like to start a project without gathering it. If you don't know who you are targeting it is very difficult to nail down a design that will resonate with your audience and tell the story that draws them in to purchase your product or service. I gathered from their answers that their target audience was young moms and dads and, of course, their children. Kids love frozen treats in the summer, and it's a great way to get out of the house and do something fun. Their business name comes from the wife of one of the partners, Lani. And the "K" was added to give it more of a Hawaiian feel. Armed with this info I went to the drawing board and developed two mood boards to illustrate what I had in mind. 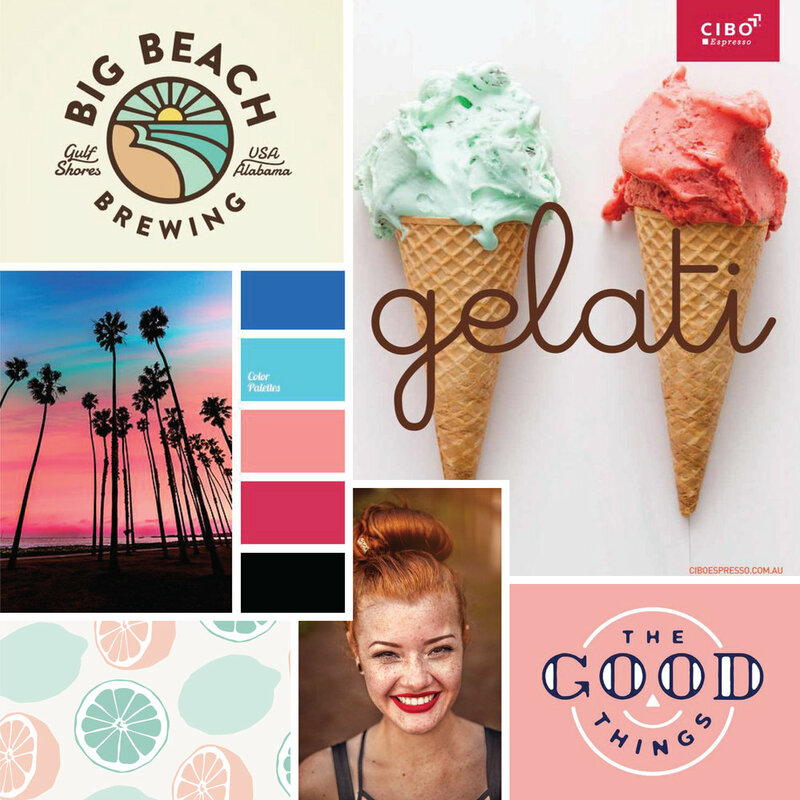 Mood boards help set the tone and expectation for the client and give them a peek into my thought process so they aren't taken off guard when presented with the logo ideas. They also give me and the client a constant direction to follow throughout the process. Though they liked both directions, they chose Mood Board 2 to follow, and with that, I was off to the races to start sketching some concepts out. I usually start out with just black and white so that color palette's don't sway people in the wrong direction. Here are my initial rough drafts. I hand lettered each option so that it was 100% unique to them. Each direction needed refinement, but ultimately they liked option 2 best, though they had quite of a few revisions they wanted to accomplish. Herein lies the beauty of investing in your branding. Because the owners were willing to spend more on their design work, they were able to give a lot of input during the revision process to get the branding exactly how they wanted it. Taking and applying constructive feedback is one of my favorite things to do because it's challenging to figure out how to incorporate certain ideas. However, when you find that balance between using both the client's and my own ideas and combine them into a creative solution to their problem... Well, it doesn't get much better than that. After spending some time, I came up with these three options. They loved the Hawaiian feel of the text, flowers, and colors and ultimately chose the blue option as their primary logo. 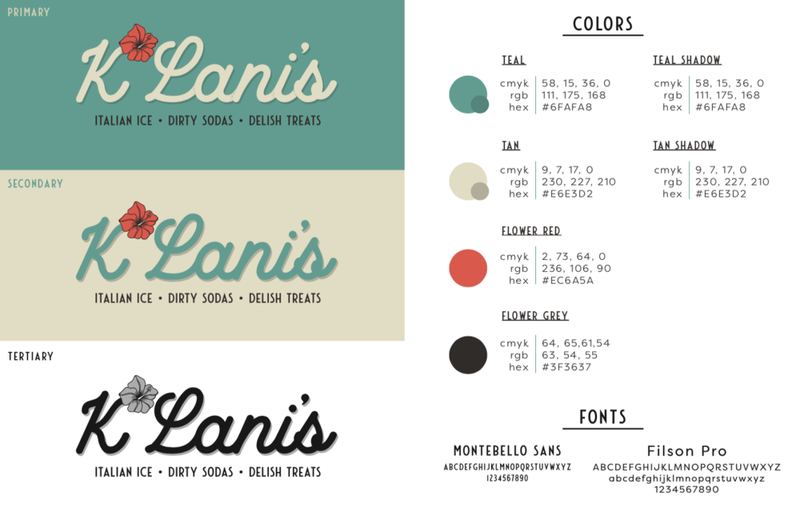 In all of my branding projects, I include all of the colors and their formulas for print and web applications. I also always include a black and white version of the logo for use on legal and financial documents. And lastly, I give font selections so that this 8.5x11 document can act as a mini style guide. 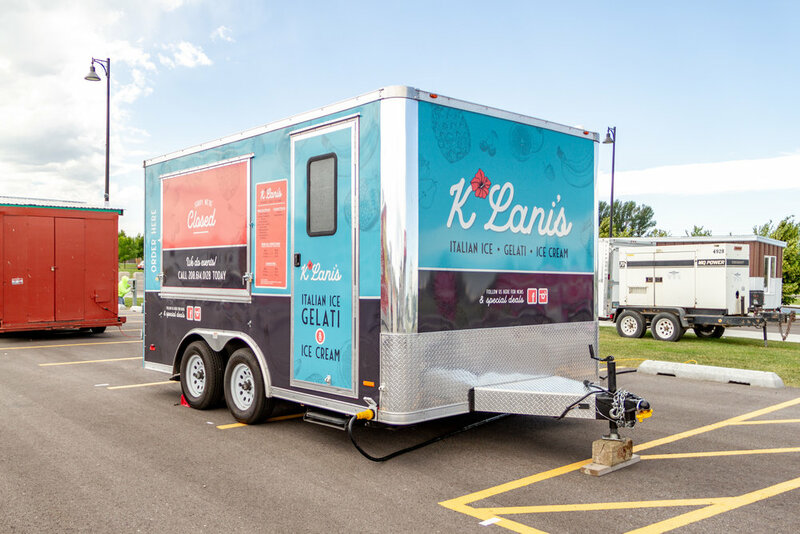 Now that we had laid the ground work for the brand by completing the overall look and feel of the brand, we moved on to wrapping their food trailer! I've designed a lot of wraps in my day, but this one is the most fun I have had yet. It turned out so colorful, vibrant, and fun. It is always eye catching no matter what event I see it at, and it goes to show that investing in your branding pays off in getting you noticed. BOOM! I LOVE how this thing turned out, all of the colors look fantastic together and make it jump into your line of sight. 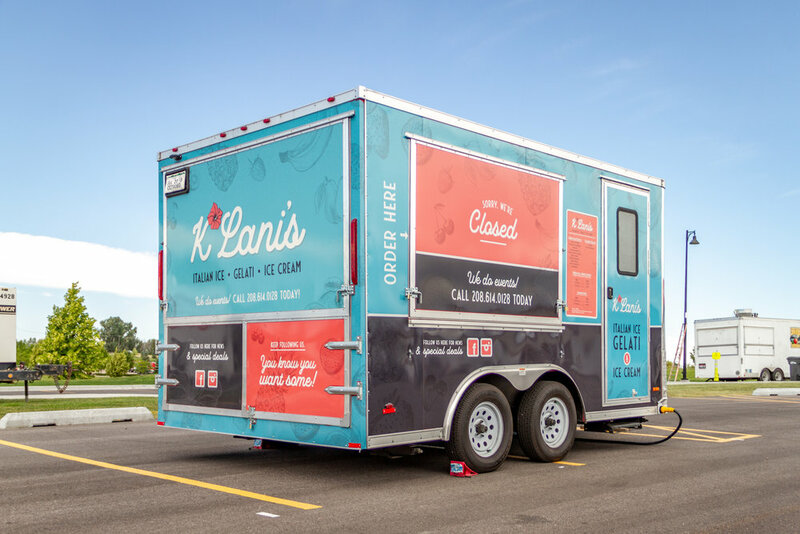 K'Lani's was a fun, imaginative project that stretched me and the client to try things we weren't expecting, and I love that they were willing to have me work with them in developing this brand. There are so many ways to make your business stand out from the competition, but quality branding is one of THE BEST ways to set yourself apart. When a potential client or customer sees that you have invested in your appearance, the next logic jump is that you invest a lot in the quality of your product or service. If you like what you are seeing and love the idea of working with me to develop your brand, then by all means click the button and fill out the form to get the ball rolling. I would love to work with you!